All you need is a tee shirt, a patriotic bandanna, steam-a-seam and a sewing machine! Don’t worry, I’ll walk you through the whole process. Its really super easy! Start by washing and ironing both the bandanna and the tee. Be sure to throw in a color catcher when washing the bandana. Once they’re washed and dried, given then both a good ironing. We don’t want any weird wrinkles! Following the directions of the Steam-a-Seam, apply webbing to the wrong side of the bandanna. Then fold in half and cut out your heart. Trim your heart shape to ensure smooth edges. Place the heart on your ironed shirt and use a ruler to ensure that its located in the center of the tee. If you’re not sure how high up the heart should go, hold the tee against you and move the heart around until you’re satisfied with the positioning. Once you’ve found the correct placement, carefully remove the backing. Iron onto the shirt. Using a wide zigzag stitch, carefully sew around the edges of your heart, securing it permanently to the tee shirt. Once done, pull the threads to the wrong side, tie a knot as close to the bottom as possible and then trim the threads, leaving a 1/2 tail. This is to ensure that the stitching doesn’t come undone. And there you have it! Your very own ‘Merica Love Tee!! See, I told you it was easy! And honestly, a lot less expensive than most of the patriotic wear available online. I got my shirt and bandanna at walmart for less than $7! Not including the washing and drying time, this project took me about 20 minutes! And now I have a seriously cute ‘Merica Love Tee Shirt to rock all summer long! My very own #DIY ‘Merica Love Tee to Rock All Summer Long! Are you rocking and patriotic apparel this summer? If you make your own ‘Merica Love Tee I’d love to check it out! 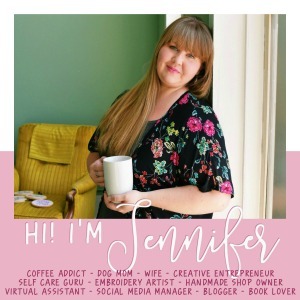 Leave me a link in the comments or tag me @busybeingjennifer on instagram! Love this! And it would look great on anything! so cute! love the serged edges! Loving this shirt so much! That is so cute! Definitely going to pin this. This is an awesome idea! I would love for you to link up this project to the Stitch It, Blog It, Share It Link Party going on now at BehindtheSeamsSewing.com. Thanks for sharing with #SmallVictoriesSundayLinkup 5/31/15. I stink at sewing along the edges for an appliqué – yours looks great! Everything you make always turns out so cute! I love this and it’s perfect for all the patriotic summer holidays! Thanks so much for sharing with us at Share The Wealth Sunday! This is absolutely darling! And a little classier than some of the stuff you can buy!! Thanks for sharing this with us at Throwback Thursday this week! I love this! and how easy to make! Thanks for sharing on the Best of the Blogosphere! That turned out super cute and it looks like something I could almost pull off even! Thanks for sharing at Throwback Thursday!